Do you have custody of your child on Wednesdays between 12:30 and 6:30pm for example? It is here that these recurring visits can be defined. 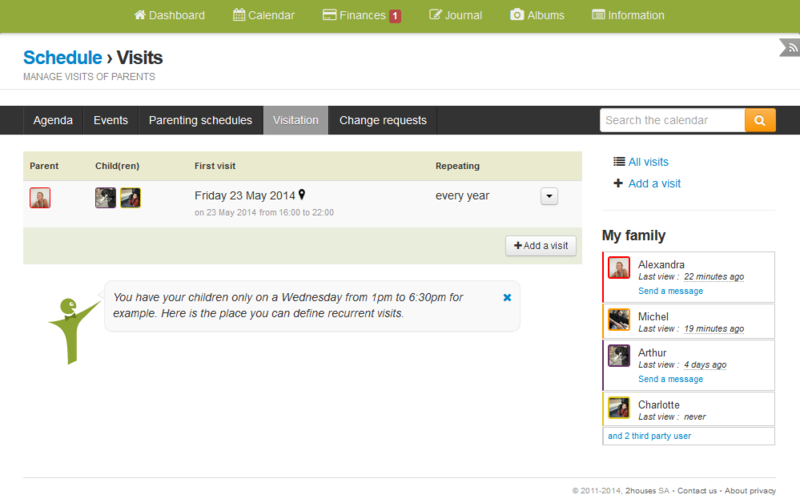 Adding visits to the calendar lets you add time slots for when the other parent will have access to one or more children. Organisation has never been so easy! 1) First, click on “Calendar” in the upper menu. Click on “Visitation” and then click on “Add a visit in the calendar”. 2) You’re now in the visit wizard. To start, choose the parent that will visit the child, and then choose the child this visit applies to. Now, choose a date for this visit, a start time, and an end time. Choose the frequency for this visit, every day, week, month or year. If this visit does have an end date, uncheck the box “no defined end date” and choose an end date in “Repeat until:”. Should this visit not have any end date, leave the box checked. You can also add a place for this visit and some notes. When you’re all done, click on “Save” at the bottom of the page. 3) You have now added a visit, and you can have a look at all the visits in this menu. You can have a look at the parent and the child this visit applies to, the date, the place, and the frequency. You can edit or delete the visit by clicking on the arrow to the right. 4) Once your visit is saved, it automatically appears in the calendar. If you click on it, you’ll see the details of the visit and will be able to remove or edit directly from the calendar. Now you know how to add a visit to your calendar ! Family organization becomes easier than ever!